Fall drives to see brilliant changing leaves are a Colorado right of passage. Set against a backdrop of a blue Colorado sky and the dramatic colors, these four routes are beautiful and sometimes a little quirky — look out for a fake glacier, a frozen dead guy, a town that inspired a TV series and the legacy of a benevolent, canyon-dwelling hermit. From Denver, take I-70 west to exit 238 (Fall River Rd.). Follow Fall River Rd. north for nine miles to the St. Mary's Alice trailhead. Although not restricted to 4WD vehicles, the road is very steep and winding. Despite its name, St. Mary's Alice glacier is more of a perennial snowfield because it doesn't flow. You will see, however, the changing fall colors of dense willows and Rocky Mountain bristlecone pines. This winding alpine drive is convenient and easy to find, ending with the option of a short, moderately difficult hike. If you decide to attempt the 1.5-mile hike to the "glacier" and lake, there is a fee to park. 1.5 miles might not sound long, but it is an uphill climb at elevations reaching 11,000 feet. Your reward for your hard work: stellar alpine views and the rare right to say you've hiked a perennial snowfield. Start in Conifer, 15 miles southwest of Denver. Travel along Route 285 traversing Kenosha Pass. End in Fairplay, the largest town in the South Park valley. TV fans recognize the name South Park from the eponymous animated series, but only the most dedicated fans know that the show is actually based on the writers' experiences growing up in Conifer, not South Park. This drive connects both of these areas via high-altitude Kenosha Pass, which is wide and well maintained, with easily navigated turns. It is one of the best drives in Colorado to view autumn's leaves — vibrant reds and glowing yellows of the aspen woodlands are a striking contrast to the ponderosa pines and Douglas firs around Conifer. The pass eventually spills out into the high grassland basin of South Park, where unobstructed views of the Mosquito Range peaks appear in the west. To reach the Fourth of July Trailhead from Nederland, drive south on CO 119 for 0.5 miles. Take a right on County Road 130 toward Eldora. Follow the paved road through the valley past the town of Eldora, until the pavement ends. Continue another 4 miles to the end of the road. You do not need a 4WD vehicle, but much of the road is unpaved and very bumpy. Anticipate very slow speeds. Located 17 miles southwest of Boulder, Nederland is a historic mining town that now embodies an eclectic vibe — as an example, it's the home of the Frozen Dead Guy Days, an annual spring festival celebrating one resident's amateur attempts at preserving his dead grandfather. After your drive out to the Fourth of July Trailhead, stop in at a local brewery for a bite to eat and have a craft brew. Take this chance to relax after your drive — it's on a pretty rugged and slow-going dirt road. 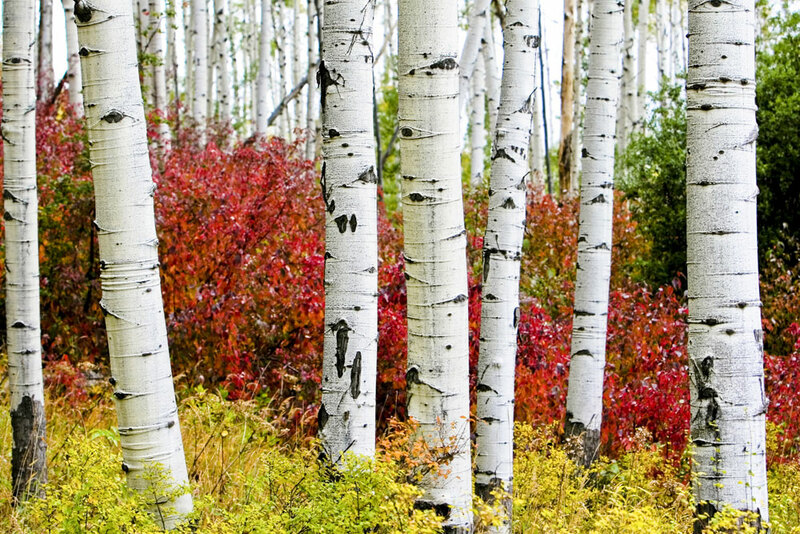 You will be greatly rewarded, though, with a fall scene of densely wooded, fiery aspen trees. The trailhead, named for its tendency to have snow on the ground until the Fourth of July, is a popular starting point for many hikes in the area. Take I-70 west to Grand Junction, exit 31 (Horizon Drive). Follow signs through Grand Junction to the monument's east entrance. Colorado's Grand Valley feels like cowboy country. As you drive along Rim Rock Drive in Colorado National Monument, you'll wish you were trotting along atop your horse, tipping back your Stetson as you peer out at the sunset-colored plateaus, canyons and arches. The drive is a well-maintained paved road traversing the monument. You'll want to get out of the car to enjoy the crisp fall air and to snap some photos of the red-and purple-streaked, water-sculpted cliff walls, whimsically arranged rock formations and sky-high mesas. 2011 marked the monument's centennial anniversary, and as one element of the celebration, a statue of John Otto was unveiled in nearby Fruita. As the monument's first park ranger, Otto was so devoted to the area that he was described in news accounts as the "Hermit of Monument Canyon."